As a cat, I don’t travel well so when I saw this week’s 52 Snapshots of Life theme was travel, I wondered how I was gonna pull it off. If anything, I’m sly and resourceful. 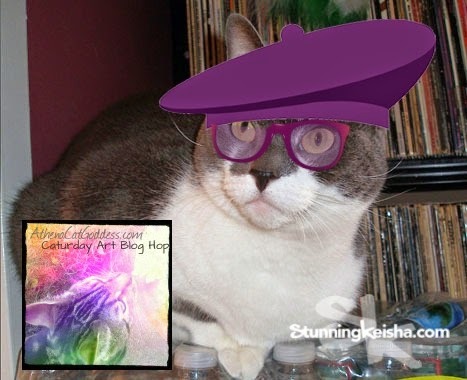 However, I’m starting with my art submission for Athena and Marie’s Caturday Art Blog Hop since the Snapshot I’ve TW’s chosen won’t bring many eyes to my blog. It’s all about hits and stunning images of ME keep the hits coming. 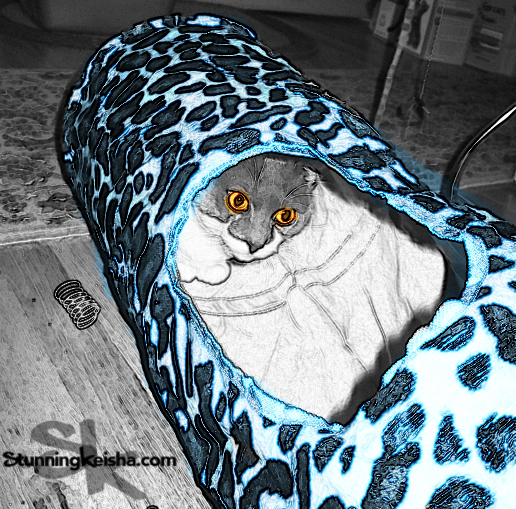 I like to travel virtually through my transport tunnel and the first tunnel pic we found had been converted to black and white so we tinted it. First we colored the tunnel with blue and then found a nice amber for my eyes. Then we applied the fresco filter, We couldn’t decide if we should apply it to the entire pic or just the background. I think we I made a good choice. Are you the lucky cat I’ll be teleporting to see tonight? When TW goes to the Blogpaws’ conference, she travels with my stand-in, HHGutt aka Plush Keisha and this is our submission to #52Snapshots. Most of the pics of Plush Keisha were taken by persons other than TW so they don’t count here. They’re also a hell of a lot better than the ones TW takes, unfortunately. Here HHGutt Plush Keisha is riding shotgun in the car. She’s actually admiring her image in the rear view mirror. Do you see it? I travel through the magic of Photoshop. 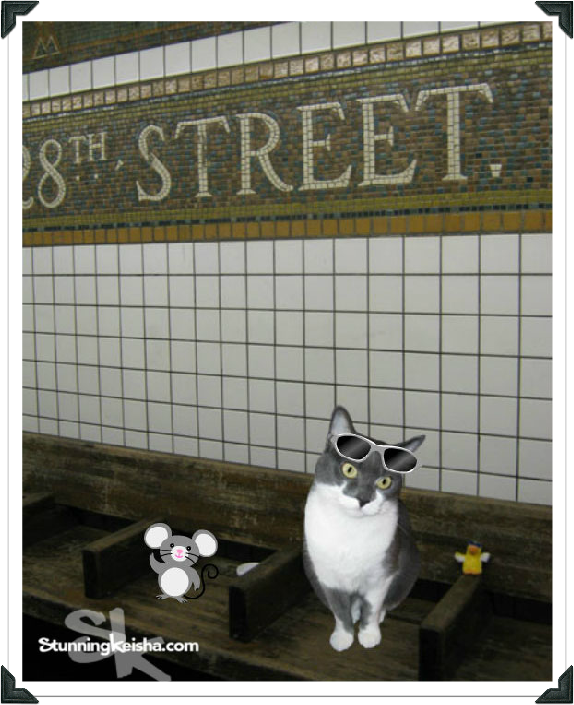 Here I’m waiting for a subway in NYC with George the Duck. TW got off here to go to an acupuncture appointment. We went our own way to create some mischief. Oh, wait, mischief was last week’s theme. What’s on your agenda this weekend? Will you be doing any teleporting? You DID do a great job! Although I could have done it for real today, since I took my first plane flight ever yesterday, to Portland! Way to go CK and I too be admiring myself in the mirror. Have a super Saturday. Traveling is usually not what cats prefer, but it's good to have a plush stand in for that. Have a lovely Caturday. I don't care much for that traveling thing either CK, the arriving part is okay though! CK we agree with you, virtual travels are a lot more exciting than real ones, which usually entail trips to the VET for us. Photoshop traveling is the BEST. You don't have to pack all your stuff into little 3 oz. bottles and you don't have to worry about speeding tickets either! ...speaking of travel, are TW and HHGutt planning a trip to Nashville? Photoshop and virtual tunnel travel is the only way to go for me top CK. We don't get all stressed out that way either. Great pictures of you tho. Love your image in the tunnel. This is such a pretty art work! 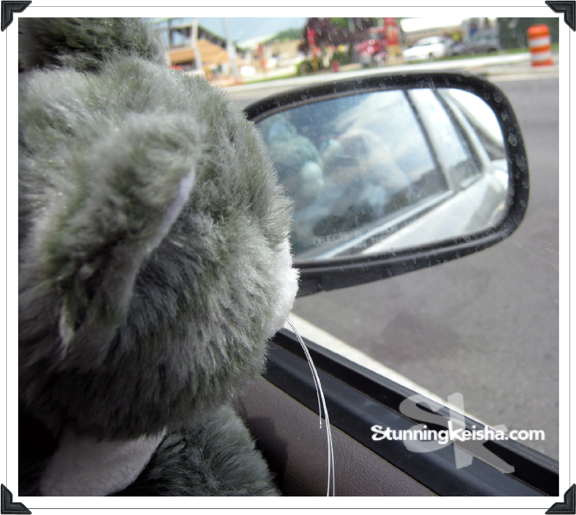 And the photo of Plush Keisha admiring her image in the mirror is very cute :-) She looks very comfy in the car. Virtual travel is better anyway....you can go anywhere you want, for free, and you don't have to spend all that time on the sometimes boring traveling part! Your teleport picture is lovely. I hope I am the lucky one. Is dat what causes da hits CK? Well we wish we wusn't so faw behind and kuld comment evewyday. but alas, mommy's always in a hurry and so we wead a lot and go and on da days we get a extwa minute we get to comment. We fink all yous fotos awe pawsum. And yous now we wuz finkin' weez not sure weez ever sed it to you zacrly, but yous always so helpful and youos always know where to send peeps fur answers. Weez wated to fank you fur bein' so on top of fings. We knmow ifin weez hav a question 'bout sumfin' yous purrawlly know where to find da answer. So again, a meowsy big Fank you. We hope we get to BlogPaws so we can finally meet at least TW. Hav a pawsum weekend. Very clever travel photos. Love the tunnel. We think you covered this week's Snapshot very well, CK! Hehehe!! The humans love photoshop! I went on an adventure this week via photoshop!! It's the only way to travel!! You look great with your cap and glasses ! and I also love the tunnel picture ! Virtual travel is the only travel I do too......when I HAVE to be in the car I hate every second of it. Something I definitely do NOT hate, is your purple glasses and beret.......trez chic! Only our flat selves have been able to really travel. You DID do a great job , CK !! From what mom tells me, the subway smell in NY isn't all that nice, so traveling through the subway with PhotoShop may be a good option!